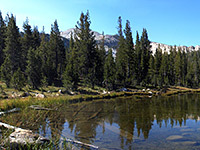 The 2.4 mile trail to Elizabeth Lake, at the foot of the Cathedral Range in the Tuolumne Meadows region of Yosemite National Park, is one of few paths in the area that does not link with any other places, so is used almost exclusively by day hikers. The route is not signposted from the highway yet still receives plenty of visitors since it begins right next to the Tuolumne Meadows campground - the largest in the park, with 304 sites, this often fills up in summer despite not being a very attractive location to stay. The sites are crammed in between tall trees that block most sunlight and all views, while the ground is stony, rooty, grassless and uneven. The entrance track winds between the trees and campsites for half a mile, ending at a small parking lot on the south edge of the campground, where the Elizabeth Lake trail begins. 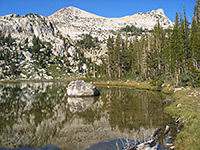 The lake resembles several others in the vicinity (Cathedral Lakes, Sunrise Lakes, Polly Dome Lakes), being surrounded partly by forest and partly by meadows, with a steep granite cliff face at one side. It is pretty, peaceful, easily reached, and a good target for a half day hike, gaining a moderate 850 feet in height. Elizabeth Lake topographic map, Tuolumne Meadows trails. Elizabeth Lake, at the end of the trail. From the carpark at elevation 8,700 feet, the well-marked path immediately crosses the long distance John Muir Trail (the section between Tenaya Lake and Lyell Canyon) then starts the climb up the wooded hillside beyond. The steepest part is at the beginning, ascending steadily through a dark forest of tall lodgepole pine trees, which becomes a bit more open after a while, and the ground less sloping. One last short climb reaches a flatter area where the trees are half the height of those lower down, allowing more light to reach the ground so grass and flowers can grow. A small, clear stream (Unicorn Creek) flows gently at one side. Granite mountains are now visible ahead and the woods eventually give way to verdant meadowland with streams, shallow pools, moss, grass, and a sprinkling of small white boulders. The land is quite marshy around the edge of the lake, and the path splits into several branches leading to different parts of the shoreline, linked by a one mile loop trail that runs all around the perimeter. 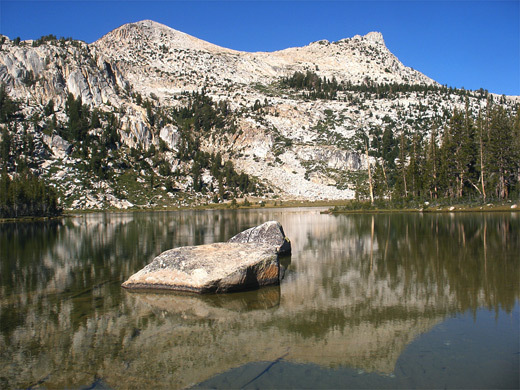 A few large boulders poke out of the water at the near edge but most of the lake surface is unbroken, stretching across to the curving, layered, east face of Unicorn Peak, rising 1,336 feet above - classic Yosemite scenery. 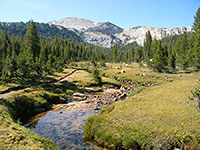 Although the official trail ends here, more adventurous hikers can either climb the rocky slopes to summit of the peak, or walk further south, along a fainter, unofficial path, over a ridge in the Cathedral Range, and down the far side to remote Nelson Lake, 3 miles from Elizabeth Lake.